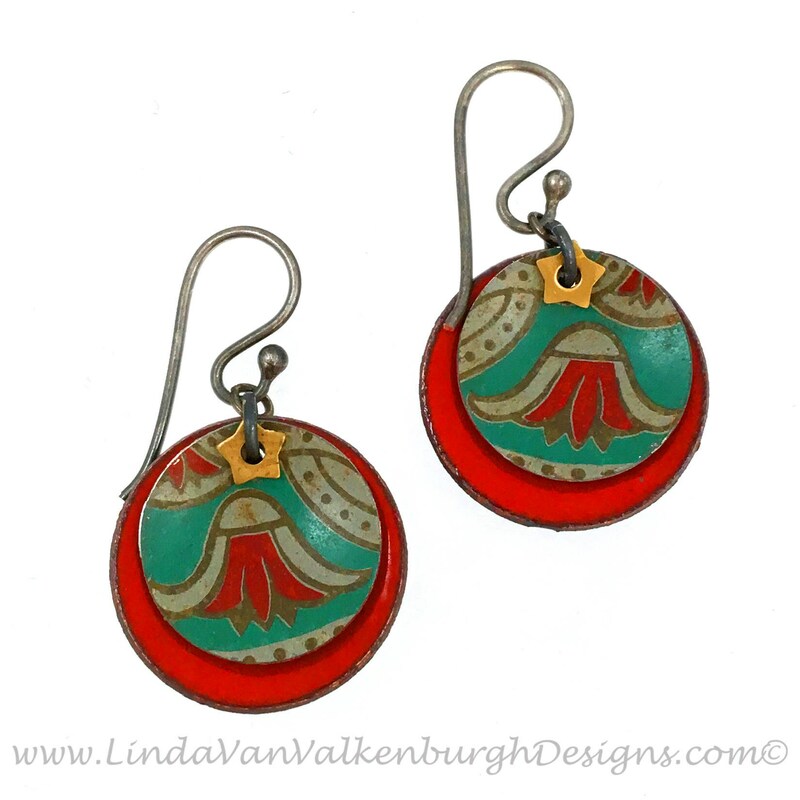 Offbead and Eccentric - The focal point of these earrings are made of tin from vintage English Daher tea and biscuit boxes and are complemented by an organic torch-fired enameled disc. To tie everything together, this design is embellished with a brass star. All wire is sterling silver and has been oxidized to a deep dark gray so the tin and enamel can shine as the centerpiece of the earrings. Ear wires are handmade of sterling silver wire. 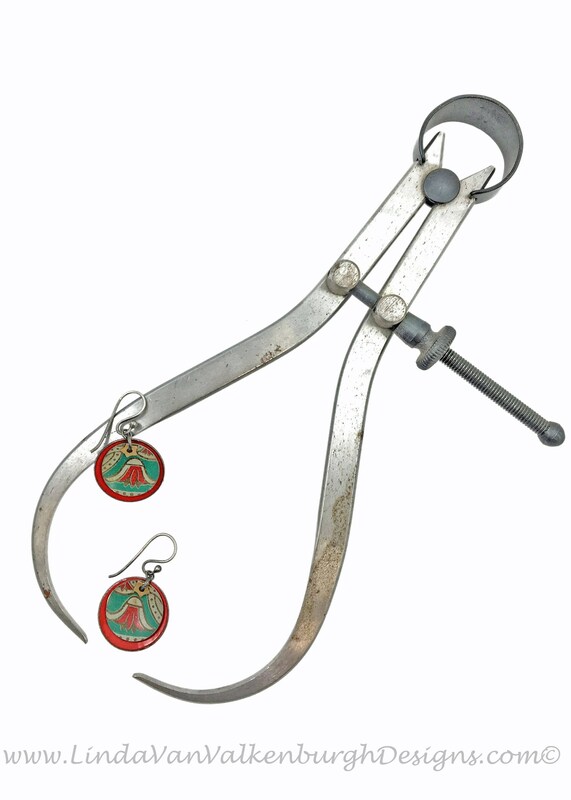 Each earring is approximately 1 ¼ inch in length, and ¾ inch wide. The antique Daher tins that I have collected over the years and work with are very colorful and beautifully decorated in a variety of themes. These tins were designed and manufactured in England with some being over 50 years old. Each tin has seen a bit of life and history over the years, they may have imperfections but this only adds to their life story and charm. You will see these imperfections here and there in the components I use in my jewelry, making each piece unique and one of a kind. 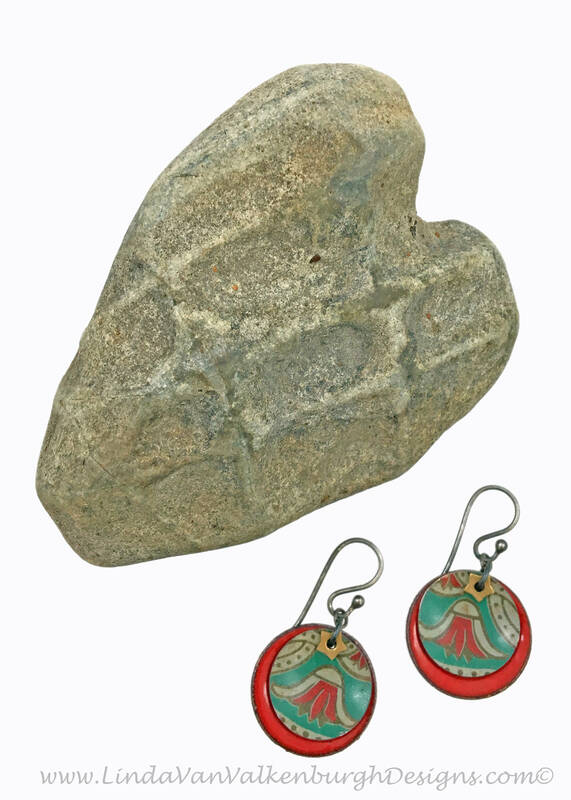 Complementing the antique tin components are colorfully enameled concave copper discs. The art of torch fusing glass to metal, enameling with a torch rather than enameling in a kiln, is very organic and outcome is never the same but always pleasing. The backs of the copper discs have been roughly counter enameled in a black glass as to not compete with the rich color inside the disc. 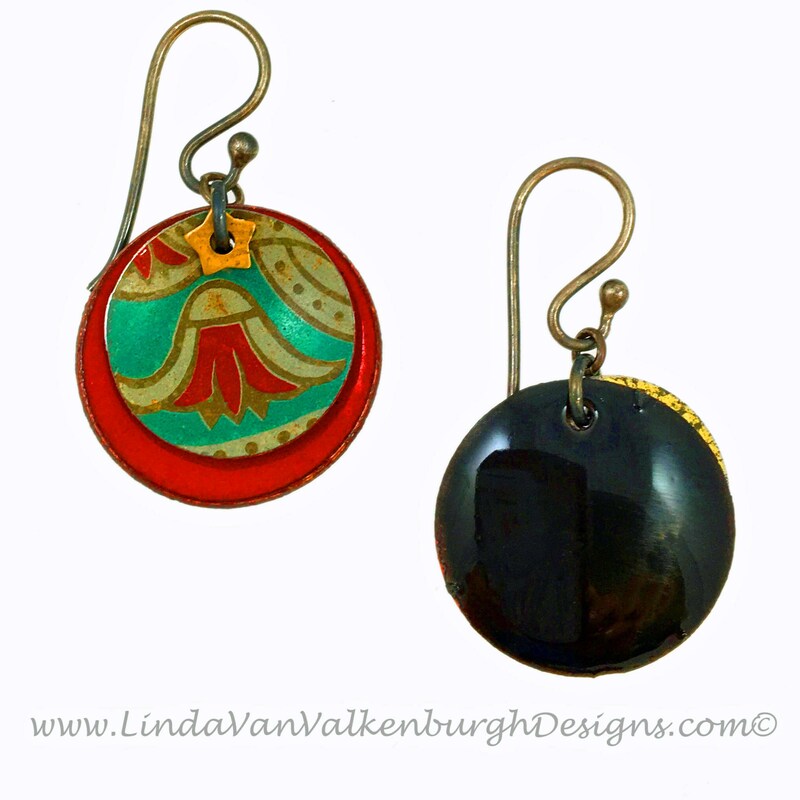 Please feel free to contact me with any questions and thank you for visiting www.LindaVanValkenburghDesigns.com. Please contact me if you would like to make other arrangements. Standard delivery rate for a small item (fits in 3”x 3” jewelry box) within the United States is $7.00 per item. Standard delivery rate for a large item (larger than 3”x 3” jewelry box) within the United States is $10.00 per item. I’m sorry but I do not ship internationally. My standard delivery charge is not just the cost of postage, but includes order processing, packaging, handling, and shipping of your order. All orders are shipped within 2 working days after receipt of payment. Orders will be shipped in a bubble-padded mailer or corrugated box. All small jewelry items are shipped in separate complimentary cotton filled jewelry boxes with logo sticker and ribbon. All jewelry will be on or attached to an attractive jewelry card. Please contact me if you are not satisfied with your order. I offer a full refund (less shipping costs) as long as the item(s) is returned in new condition within 15 days of the initial purchase. A credit for the purchase price, less shipping costs, will be made to the account through which the item(s) was purchased. 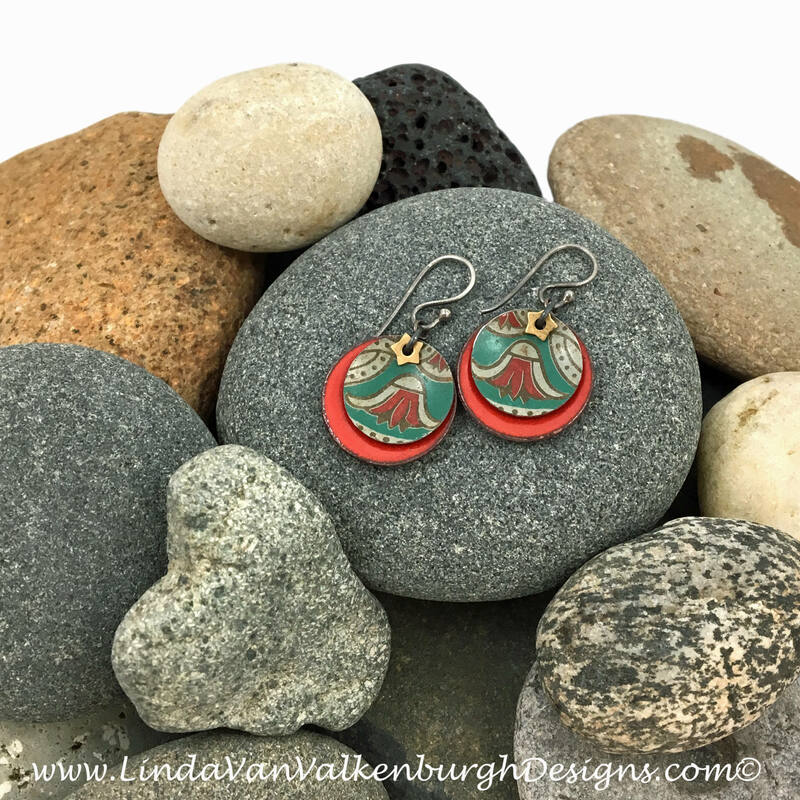 Linda Van Valkenburgh Designs, etsy.com, and Paypal all take the privacy of your personal information very serious and we will not sell or rent your personal information, or a list of our customers, to any third parties.